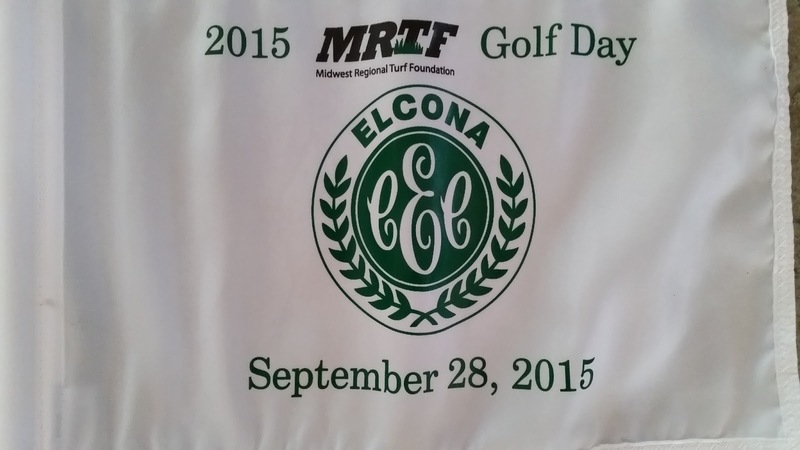 On September 28th, Elcona is hosting the Midwest Regional Turf Foundation’s annual Golf Day. 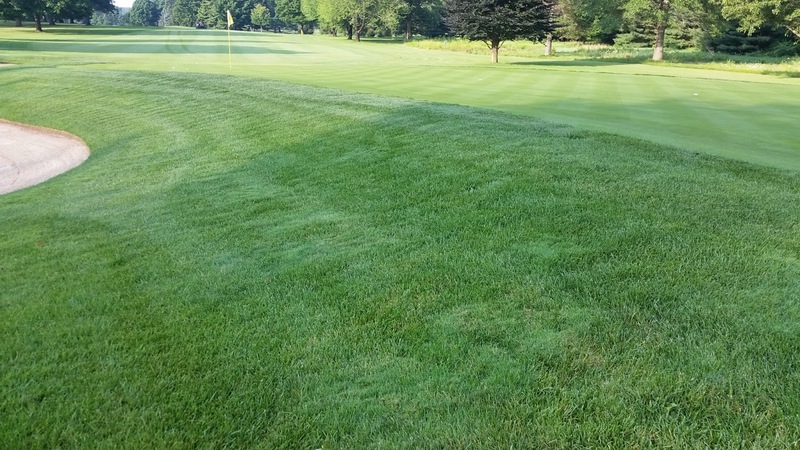 In previous blog posts that you can read here and here, Greg and I have highlighted the great efforts that this foundation has performed to further develop and grow turf research in Indiana and the US. As I wrote in March, I thank all of you for Elcona’s long standing support of the MRTF and its efforts. The MRTF has a few openings for its Golf Day fundraiser on the 28th. The Golf Day is one of the MRTF’s largest fundraising events and is always an entertaining, fun day on the golf course. The event begins with a box lunch and registration from 10:30 til 11:55, followed by a shotgun start at 12:00 p.m. The golf format is “Elcona Best Ball”, meaning 1 net score counts on the par 5’s, 2 net on the par 4’s, and 3 net on the par 3’s. An awards reception follows golf, where industry leaders will speak and hand out prizes. Cost is $125 per person, and includes golf and two drink tickets. Additional details on the event can be found by clicking here. If you are interested in getting a foursome together and playing on the 28th, you can register online at http://www.regonline.com/mrtfgolfday, or email me at ryan@elconacc.com and I can help sign you up. Thank you again for all of your support of turf research here in Indiana, and I hope to see you on the 28th! We are halfway through September already. 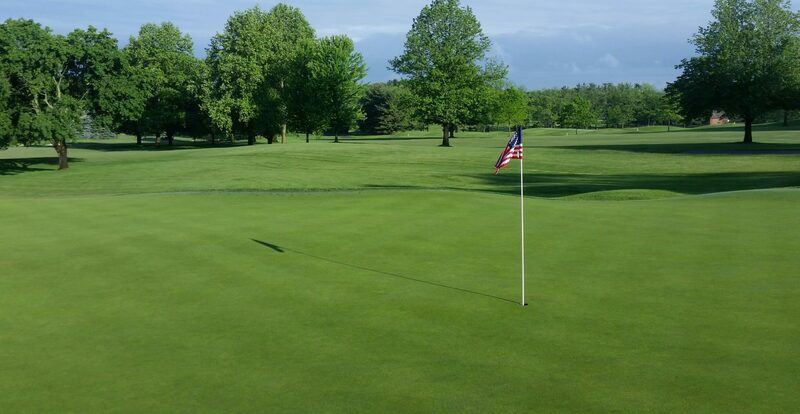 The month has provided some great weather to get out and enjoy the golf course. 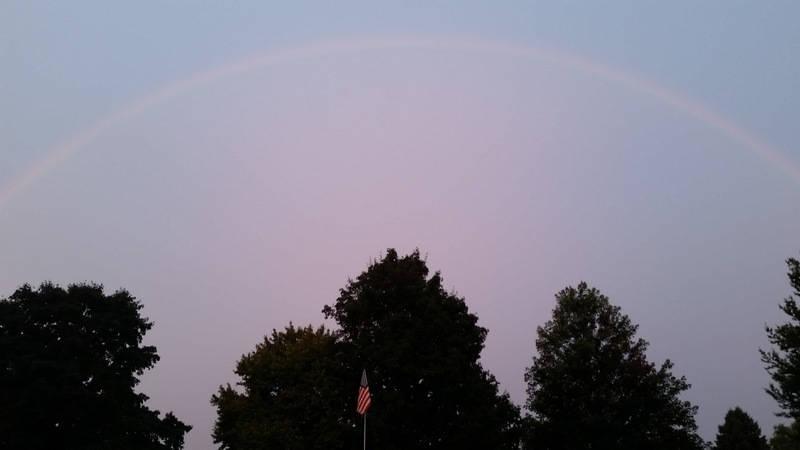 Last Friday’s rain was quite the damper on the Boys and Girls Club Ryder Cup fundraiser, but provided me the opportunity to take a couple pictures of this nice rainbow over the course in the morning, ahead of the rain. This sight was one reminder of many the awe-inspiring images that I have the opportunity to see and enjoy on a daily basis. The picture to the left, is not one of those images I enjoy seeing. This is damage left by a raccoon or skunk, forging for food. This time of year white grubs are close to the turf surface, and areas that are normally untreated, like this area near the woods on 13, provide areas for animals to dig in search of their next meal. 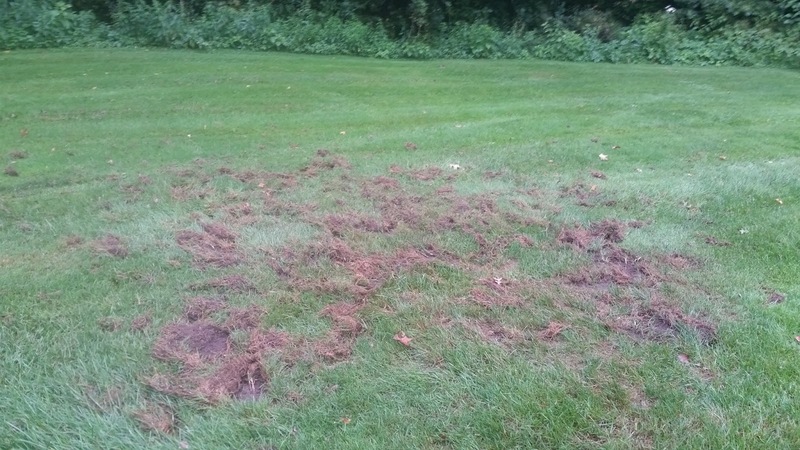 Mole activity is increased this time of year as well, for the same reason: grubs are a source of food for them. 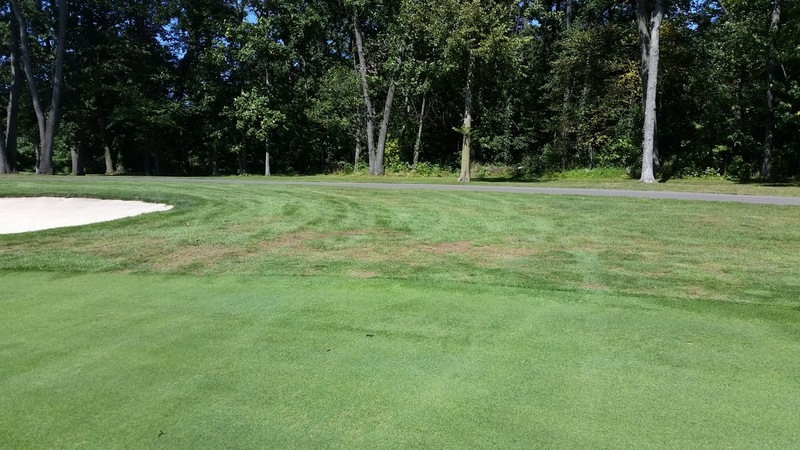 We are treating these areas as needed to eliminate the food source so that damage to turf is minimized, and also will be seeding the damaged turf. These areas will be marked as ground under repair for the time being. The picture to the right is on the north side of 13. The damage to the turf is a result of 2 quick acting fungal diseases: grey leaf spot and foliar pythium. We have treated these areas to knockdown any additional fungal activity, and will be seeding this area later today. Again, this area will be marked as ground under repair until the turf stand recovers. Finally, a few of you have asked about the differing, inconsistent lies received on any given hole in the turf surrounding the green. In 2012, the intermediate strips around the greens were removed and replaced with 100% Kentucky bluegrass. This turf was quite stringy last year and in places still allows a ball to sink down lower than other areas outside of this newer sod, which is compromised mainly of a mix of Kentucky bluegrass, perennial ryegrass, Poa annua, and roughstalk bluegrass. In this blog post I wrote last year, I described the possible scenarios that allowed shots to sink into the bluegrass around the green. 2 weeks ago, we applied slow release fertilizer to promote new growth near the crowns of the plant to help support the ball and keep it from sinking down below. Throughout the month we will be aerifying the surrounds with solid tines to alleviate compaction and increase the health of this turf by introducing fresh oxygen to the rootzone and allowing new channels for root growth and development. 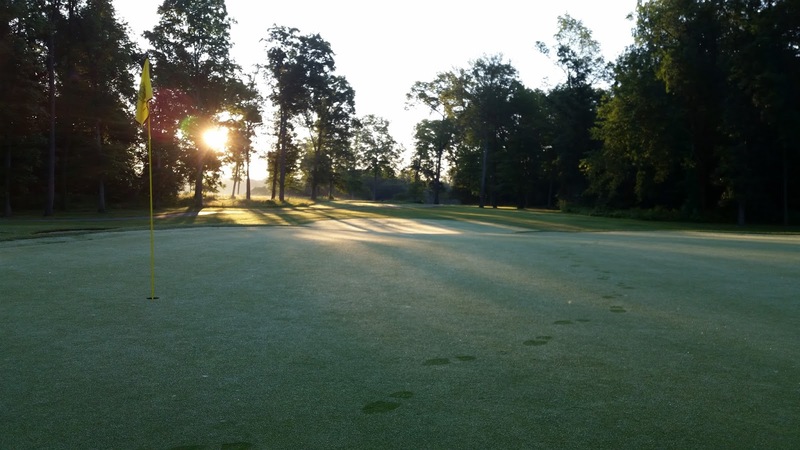 If you have questions about anything on the golf course, please feel free to contact me at the maintenance shop, or email me at ryan@elconacc.com. Thanks, and have a great day! With the current muggy, cloudy conditions and the increasing chances of rain in the forecast for today, we will be postponing tee aerification. We will perform this necessary practice on Monday, September 21st, which is a closed day for the golf course. Cores removed from aerification must be completely dry for us to remove them successfully without making a muddy mess. It is my opinion that we will not have an adequate drying window today.